A fantastic day all around. Our performance this afternoon went off without a hitch! 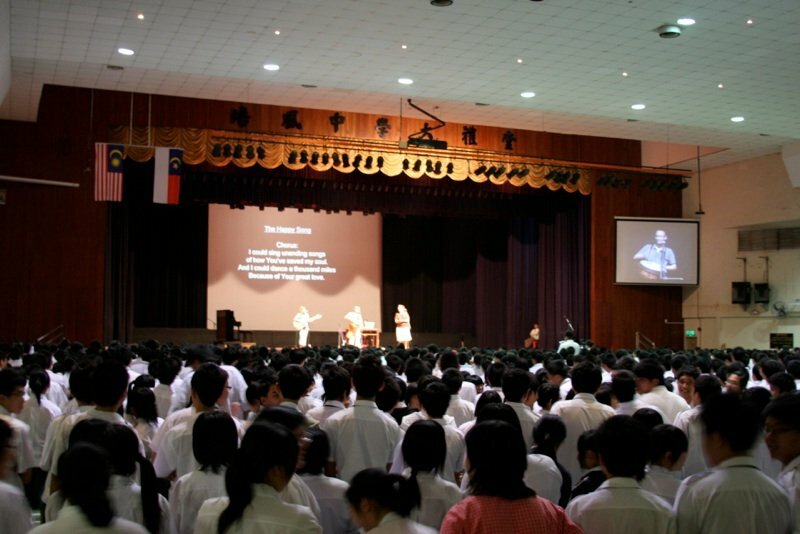 The students were into the songs, and our set list was 80% worship music. In between each song, we took turns introducing ourselves and at the end, the Principle gave us a giant Chinese Gift Basket filled with all kinds of goodies (“Instant Ice Barley Lemon Drink”, “Instant Brown Rice Cereal”, “Instant Brown Rice Chocolate Cereal”, and “Brown Rice Powder” were among the treats : ). After the assembly, I headed to the basketball court where I whooped up on some fifteen year olds for about two hours. Fortunately, it was overcast today so the head wasn’t too bad. A quite bite to eat in the canteen and it was off to rest. Every night at 7:30pm we have a team meeting. Because we were all in such high spirits from the afternoon assembly, we decided to simply hang out an play cards for a while. 9:45pm – Bed time. I have two classes to teach tomorrow, with Friday and Saturday off. No plans as of yet, but I’m sure basketball will be involved.